Manufacturer of a wide range of products which include simple stone temple, stone temple (todi design & hindu architect mandir), stone temple with baramda, stone temple with multiple pillars, handicraft marble temple and stone handicraft temple. Our installation team install these temple at a client site and once installed they last forever. The material does not change with time and remains as new as always. This temple also does not require any type of colour paints or special maintenance activity except cleaning from time to time. Readymade with natural stones These are lifetime temples With little maintenance required. Usage/Application Building & developing temple as offering to god. These temple come with adequate space needed. Packaging Details: Loadings, packing, transport, GST and site arrangements etc are extra. These cost will be discussed and fixed. 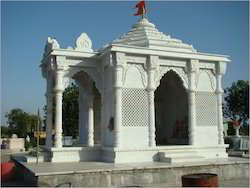 Life time durability, Mandir is installed and ready within 1 month, Gives unique value to locals etc High value for prices, This mandir cost Rs. 450,000/- only. Client need to take care of only variable costs etc Apart from Rs. 450,000/- client needs to arrange & pay for transportation, unloading, Scaffoldings. counti... cement, areldite, foundation civil works, labour stay & food arrangement etc..
GST applicable 12% GST charges are extra on bill. 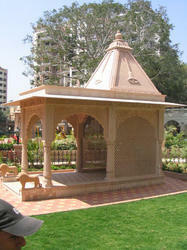 Stone Temple with Baramda(veranda), is most liked product of MMStones. We have installed more than 42 such temple all over India. MMStones has devloped this product by keeping in mind various factors involved in construction of a hindu temple. Temple sizes & carvings are also fixed in standard manner that it brings down cost as well as suit client needs. 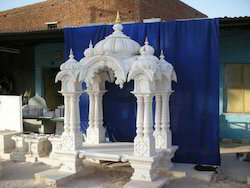 These mandir come in pre cast sizes, and we load mandir in parts. Total weight is 12 Ton. Once material reaches client site, our installation team install temple with in 2 weeks. Sand stone pre cast temple. Size 15 ft wide, 21 ft leanth and 25 ft height. 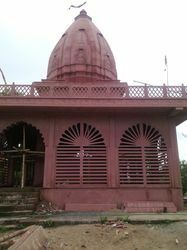 The main temple is made in 8ft * 8 ft size and 3.5 ft is given for parkama marg. Front Baramada will have size of 9.5ft *15ft. Total no of pillars in this mandir is 15. These temple are customisable as per client needs. so size and price can be deceided as per client needs. We give price for stone + carvings + loadings + installation. all other variable cost such as GST, Transport, Cement & other local site needs are to be paid extra. 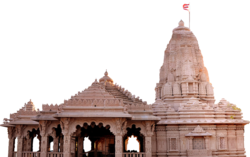 Traditional temple design is what makes these temple distinguished and Attractive. 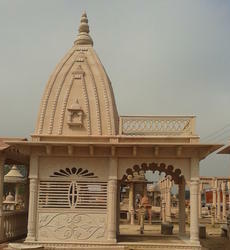 These Temples are developed by using finiset of Amba Ji Marble. Our installation team install these temple at client site and once installed they last forever. The material does not change with time and remains as new as always. These temple also does not require any type of color paints or special maintainance activity except cleaning from time to time. 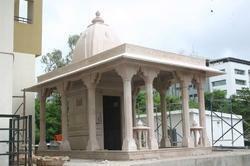 Our installation team install these temple at client site and once installed they last forever. The material does not change with time and remains as new as always. These temple also does not require any type of color paints or special maintainance activity except cleaning from time to time. 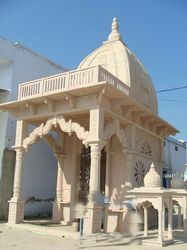 This temple come with a size of 8ft wide, 14 ft leanth and 21 ft height. It is ideal for people who wants to develop temple in outdoor.